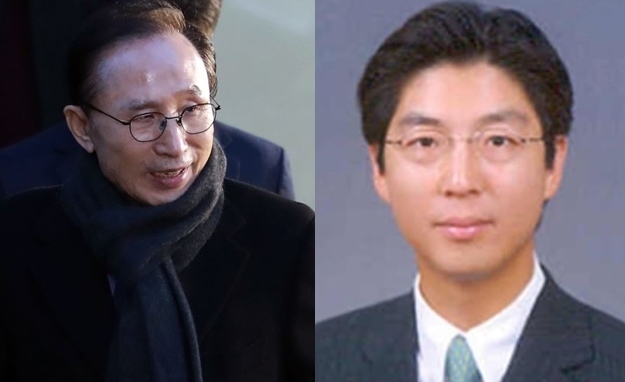 Prosecutors said Monday they raided the residence and office of the son-in-law of former President Lee Myung-bak over bribery allegations. Investigators from the Seoul Central District Prosecutors' Office searched the premises of Lee Sang-joo, a senior executive at Samsung Electronics Co., according to the office. He is married to Lee's eldest daughter. The prosecution office said later in the day that Lee is undergoing questioning. Prosecutors suspect that he received kickbacks from an unidentified third party on behalf of the former president. The former prosecutor is currently working on the legal compliance team of the tech giant. Prosecutors are paying close attention that he was one of the directors of the Cheonggye Foundation, a nonprofit organization the ex-president established with his own money. The foundation is now at the center of bribery allegations surrounding the former president. A key official at the foundation has been arrested for trying to destroy financial transaction records related to the ex-president's assets. It is a fresh bribery allegation against the ex-leader, who was in office from 2009-2013, in an investigation running separately from the ongoing probe of him over a slew of corruption allegations involving an auto parts manufacturer run by his family, the presecution added.